In the late 1950s Professor Robert McKelvey of Mathematics and I and others would talk occasionally about the problems that were becoming apparent as Boulder’s population was growing from the 1950 U.S. Census figure of 19,999. The earliest recollection that I associate specifically with the Blue Line was one evening about 5 PM, I was walking home from the Physics Building on the campus of the University of Colorado (In 2000 this is the old part of the Ramaley Building) and as I reached the cul-de-sac immediately north of Norlin Library, Bob came by on his bike and we stopped to talk. There were perhaps 15 or 20 people at that first meeting, and Bob was in charge. With real vision, he outlined the problems and we discussed what might be done. Here were some of the problems. Homes were being built higher and higher in the foothills. The City Council seemed ready to expand the City’s water system by installing pumping stations to deliver city water to developments that were at higher elevations than the existing city reservoirs. The Council seemed to be careless and was ignoring engineering recommendations in regard to hillside stability and drainage when it approved developments in the foothills. Boulder’s population was growing, so we knew that the pressure to develop the foothills with trophy homes would be increasing steadily. I am not sure of the chronology, but I remember that at some point the City Council was considering installing a pumping station near the mouth of Sunshine Canyon to pump city water up to subdivisions that were being proposed to be built up the Canyon. Here are four examples, listed from south to north, of the type of things that were going on that caused our concern. Sometime in the mid-fifties, the City Council had a proposal from a developer to put a large apartment complex on the Chautauqua fields just immediately south of Baseline Road. 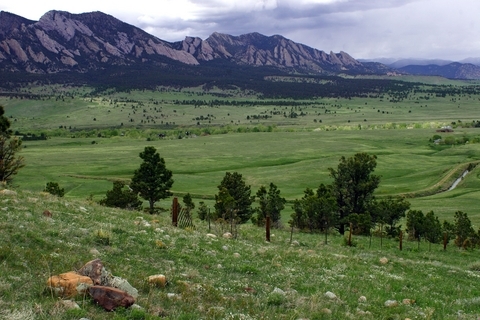 The developer claimed that this development would be a major asset for Boulder. This was stopped by a very remarkable lady, Mrs. Florence Sibert. At some point in the 1950s the City Planning Board approved the subdivision plat for a new subdivision on the slope of Flagstaff Mountain west of 6th Street. College Avenue and 6th Street were both paved, but west of 6th, College was a gravel road that climbed steeply up the slope and ended perhaps a hundred meters up the slope. The subdivision in question was west of the end of the gravel road and the proposed subdivision could be accessed only by driving up the steep gravel road. When the Planning Board approved the subdivision, they sent the plans to the Council with a list of about six specific engineering requirements having to do with stabilizing the steep slopes and with taking care of runoff from rainstorms. Council approved the subdivision without requiring that the developer make the specified engineering improvements. This left a paved subdivision that was reached only by a small steep gravel road. The existing residents along that gravel road were happy with things as they were before the subdivision came along. Quite understandably, they did not want to have to pay for the paving of the short road section in front of their homes just in order to accommodate a subdivision to the west of them that they did not want. After the Council approved the subdivision without the recommended engineering drainage requirements, I remember at a meeting, Bob saying, “This proves that you can’t trust the City Council.” This seemed to support our feeling that the Council would not make the hard decisions that were needed to protect the people of Boulder. The wisdom of those engineering requirements was demonstrated by two incidents some years later. Possibly because of the lack of measures to stabilize the cuts the developer had made in the hillside, there was a minor slide of land above a cut in a steep slope. It was sufficiently small as to do little damage, but it could have damaged a home had it hit one. In the second incident, a heavy rain fell, and the paved subdivision streets caught the large flow of water and directed it down the steep gravel section of College Avenue. Large quantities of gravel were washed out of the steep road and were deposited in the house at the NW corner of 6th and College. It cost the City plenty to clean up the mess, pay for the damage, and then to pave the short gravel section of the road. I am not sure of the chronology, but I remember news that at some point the Council was considering annexing land well up Sunshine Canyon, and this would then require the City to purchase pumps and build a pumping station near the mouth of Sunshine Canyon to pump city water up to the proposed subdivisions. I am not sure where or how the idea of the Blue Line originated, or how it came to be called “Blue.” But the idea emerged of drawing a north-south line and saying that the City would not supply city water west of that line. Bob recognized that such a requirement would have to be a part of the City Charter if it was to be meaningful. If the Council established such a line as an ordinance, it would not be permanent, and it could be modified by the Council at any time. But the Council was not interested in placing any such blanket restrictions on development. Their approval of the subdivision on West College galvanized our group into action. Sometime in early 1959 we formed ourselves into a group called “Citizens for the Blue Line.” Bob McKelvey was Chair of the group, and I was Vice-Chair and Secretary-Treasurer. The formation of the Committee was recorded in the Boulder Daily Camera on April 21, 1959. After a number of discussions of where the Blue Line should be drawn, a group of us took a Sunday hike in the foothills from south to north to identify landmarks that would define the Blue Line. There were only four or five of us, and I think that in addition to Bob and me, we were accompanied by Hugh McCaffrey, Harold Walton and possibly someone else. I carried a clipboard and took notes of landmarks. We started our hike somewhere around the present west end of Dartmouth Avenue. From there south, the Blue Line was to be a contour line at an elevation something like 30 feet below the mean water level in the Chautauqua Reservoir, so we did not need any complicated description of that portion of the proposed Line. As we walked north, we generally followed the City Limits as they existed at that time. The line could not be put east of the City Limits because the City could not deny water to lands it had already annexed. There may have been locations where the Line was west of the City Limits. I then took my notes to an attorney who put the description of the Line in proper legal form and helped us with the drawing up of the petitions. I remembered the attorney as being George Williams, but now I think that is wrong. There may have been another Williams who was an attorney. We knew that we would need support in the business community if our effort was to succeed. I can remember going to talk with “Gov” Paddock who was editor of the Daily Camera. I found him in his office in the old Camera Building at 11th and Pearl at a desk that was piled high with paper and with his old antique Oliver typewriter was centered on his desk. This is the typewriter that is on display in the lobby of the new Camera Building at 11th and Pearl. Gov was very kind and very supportive. He recognized that I was just a neophyte and he offered advice and encouragement. I also talked to several other business people on Pearl Street including Jim Yeager who operated the women’s wear store Brooks-Fauber on the north side of Pearl Street between Broadway and 13th Street. I was very pleased with their indications of support for the idea. The Council had rejected our request that Council put the question of a City Charter Amendment on the ballot, so we had to petition to have a special election. At the top of the petition one had to print the names of five citizens who were sponsoring the petition. As I recall, Bob McKelvey and I were two of the names, and the other three were Bob Carlson, who was the minister at the First Congregational Church, Gayle Waldrop, who was Dean of Journalism and who had served on the City Council in the late 1940s, and Florence Sibert. Florence played an interesting role in all of this. She was a lawyer, but I don’t think she had an active practice. Her husband, Harold, was a Professor of Aeronautical Engineering. Florence watched the Council very closely, and she loved to catch the Council doing things that violated the City Charter, or violated common sense. On one occasion, I believe the Council was ready to enter into some sort of agreement that would allow the development of an apartment complex on the beautiful Chautauqua meadows just south of Baseline, as was mentioned above. She blew the whistle, and angry citizens joined her in stopping this unfortunate proposal. On another occasion, the County Commissioners were about to do something on Courthouse Square. Perhaps they were going to put in a great deal of parking. She looked up the records of the City’s deeding the Square to the County and found that such a use of the Square was prohibited in the deed, and in calling attention to this, she forced the Commissioners to back off in their plans. Shortly after we had initiated the petitions, Florence said she was going to withdraw from our Blue Line effort because she had a fight of her own with the City and she did not want to have the two efforts confused. The City needed to expand its water treatment and delivery system. It hired some out-of-town engineering firm to draw up plans, and these plans, if I recall correctly, called for the City to take water from the tailstock of the Public Service Company’s hydroelectric plant up Boulder Canyon and run the water to a new treatment plant that would be built further down the Canyon. The water would be treated and then would be delivered to Boulder via a new pipeline that would run down alongside the existing city water lines that were by Boulder Creek. You have seen those lines that crossed the Creek on the bridge abutments of the old narrow gauge railroad that ran up Boulder Creek to Four-Mile Canyon. Florence was not an engineer, but common sense told her that it would be irresponsible to locate a water treatment plant in the bottom of Boulder Canyon where it could be wiped out be a flood such as the City experienced in 1894. The City’s water treatment plant and delivery pipelines would all be vulnerable to destruction by a flood because both the new and the old water lines would be located by the Creek. In addition, she took issue with the sanity of the financing plans for this proposed expansion of the treatment plant. So, all by herself, Florence was going to take on the City and work to defeat a waterworks project which had come up at about the time the Blue Line effort was getting underway. She assured us that she was with us in spirit, but she wanted to have the two issues separated. The Blue Line petitions were printed, and so a small group of us set about to gather the necessary signatures. Standing outside grocery markets and on Pearl Street, we gathered signatures on petitions until we had the requisite number of signatures, with quite a few to spare. One very colorful person helped us in the gathering of signatures. This was Mrs. Helen Fischer, widow of Valentine Fischer who had served on the Board of Regents, and who was herself a graduate of the University of Colorado around 1908. The Helen Waltemeyer Fischer Field on the campus is named for her. Mrs. Fischer had a heart of gold, she was big, and she was enormously enthusiastic about projects that she supported. She was very aggressive in her gathering of signatures. The Camera of May 22, 1959 carried a letter that said the collection of signatures was going well. We collected the necessary signatures, and plenty to spare, and on May 27, 1959 I personally delivered the stack of petitions to the City Clerk, Carl Chapel, in his office in City Hall. Before the petitions were delivered, a group of us sat around our dining room table copying down names and addresses of those who had signed the petitions. We needed to have a mailing list for mailings we planned to send out during the actual election campaign. The signatures were checked and the Council was forced to set an election date. They chose July 21, 1959. There were to be two issues on the ballot. One was the City’s water bond issue which was strongly opposed by Florence Sibert, and the other was the Blue Line Amendment to the City Charter. So the battle lines were drawn. The fight was on. As I recall, the water bond issue was supported by the City Council and all of the establishment in Boulder, who seemed to pay no attention to the engineering and fiscal objections raised by Florence Sibert. The Blue Line was strongly opposed by individuals who said this constituted a denial of property rights of owners of land above the proposed Blue Line. The development sites west of the Blue Line made the developers’ mouths water. Think how nice it would be, one of them told me, to have homes up on the big mesa south of town (where NCAR is now located)! In addition, there was a philosophical debate over the best way to deal with growth. The Council seemed to feel that you should build water lines and buy pumps so you can pump city water up to these mountain subdivisions, and then the developments take place within the City and the City can control the developments to make sure they are done right. We saw this later with City Manager E. Robert Turner’s “Spokes of the Wheel” idea in which the City would extend water lines out to the Gunbarrel area and in this way the City could control the development that took place. Opponents of the Blue Line pointed out correctly that the Blue Line would prohibit the annexation to the City of lands west of the Line, but if these lands could get their own water, they could develop in the County, and the City would have nothing to say about the developments. Indeed, before the Open Space election of November 1967 there were rumors that developers with lands west of the Blue Line were negotiating to get a waterline from the City of Denver to run north from Eldorado Canyon to serve lands west of the Blue Line. We knew that the Blue Line was only a temporary holding action and we knew that in the long run, the City of Boulder would have to own these lands if they were to be protected from development. This was to be the first step, but I had no idea how we might proceed afterwards to get city funds sufficient to purchase these lands. At the end of the spring semester, Bob McKelvey left to spend the summer at the University of Wisconsin so, as Vice-Chair of Citizens for the Blue Line, I had to run the election campaign. As I recall, the total money we collected for the effort was about $500, and half of this had come from one “angel,” Frank Havice, who later was elected to the City Council. We made great use of the “Letters to the Editor” in the Camera. The main other effort I remember was the preparation and mailing of postcards to those who had signed our petitions. Professor John Greenway of Anthropology drew up a nice representation of the Flatirons with a line below them and a message something like “YES FOR THE BLUE LINE”. We had the drawing and message reduced in size and printed in blue on one side of regular post cards from the Post Office. Then we had to address these few thousand cards by hand. We had evening addressing sessions in our dining room where we all sat around the dining room table addressing the cards using names and addresses that we had hand-copied from the Blue Line petitions. Ruth Greenway and Mrs. Reuben Zubrow were two of the people I remember working on the addressing of the post cards. I took the cards to the Post Office to mail them, and we continued writing letters to the Camera. The election was held on July 21, 1959. The Blue Line passed by a vote of 2735 to 852. We were overjoyed. We had taken on the City Council and much of the Boulder establishment, and we had won. But we knew the victory was only temporary because the lands west of the Blue Line could be developed in the County, and we would have little to say about the quality and nature of the development. But at least, we had made a start. The water bond issue which was on the same ballot was defeated. Single-handedly, Florence Sibert had taken on the City and the Boulder establishment, and she had defeated them. A few years later, and with a new City Manager, E. Robert Turner, the water issue came up again, and this time the new water treatment plan was proposed to be up on a ridge where it could not be damaged or destroyed by floods in Boulder Canyon. This later bond issue was approved by the voters and the Betasso Water Treatment plant was built. Bob McKelvey came back from his summer at the University of Wisconsin that fall, and under his leadership we got the group together that had pushed the Blue Line effort. We wanted to keep up the momentum that we had as a result of the success of the Blue Line election. So we called a meeting at the Washington School on north Broadway on September 24, 1959 and at that meeting we formally established ourselves as PLAN-Boulder. Later the name was expanded to PLAN-Boulder County. The early efforts of PLAN Boulder involved William and Jean McDowell, (Bill was a civil engineer. ), Ruth Greenway, (Her husband was John Greenway, a professor of Anthropology at the University.) Gayle Waldrop, (Gayle was Dean of Journalism), Frank Havice, (Frank was a retired engineer.) Ann Zubrow, (Ann’s husband was a Professor of Economics), Al Bartlett, (Professor of Physics), Hugh McCaffrey, (banker), Bob and Mavis McKelvey, (Bob was a Professor of Mathematics.) Ed and Gladys Weibel, (Ed was a Professor of Mechanical Engineering and Gladys worked in Norlin Library), Lynn and Arlene Wolfe, (Lynn was a Professor of Fine Arts. ), Kurt and Eva Gerstle, (Kurt was a Professor of Civil Engineering). I am sure there were more in our little group. I apologize for not remembering all of the names. It is often said that the PLAN of PLAN Boulder County is the acronym for People’s League for Action Now. I don’t remember how the name came into being. I have the impression that the PLAN was to emphasize planning and that the name that yielded the acronym was created after the name PLAN Boulder was in place. We knew that the Blue Line was just the first step and that much more had to be done. But we had successfully completed that first step toward getting a system of Greenbelts established for Boulder. The next step was the bond issue for the purchase of the Enchanted Mesa, which was followed in 1967 by the Greenbelt / Street Improvement Sales Tax election. This issue was approved by Boulder voters and as a result, by 2008 over 40,000 acres of Greenbelt / Open Space land has been purchased and preserved for the enjoyment of the people of Boulder. In the late 1950s Professor Robert McKelvey of Mathematics and I and others would talk occasionally about the problems that were becoming apparent as Boulder’s population was growing from the 1950 U.S. Census figure of 19,999.The earliest recollection that I associate specifically with the Blue Line was one evening about 5 PM, I was walking home from the Physics Building on the campus of the University of Colorado (In 2000 this is the old part of the Ramaley Building) and as I reached the cul-de-sac immediately north of Norlin Library, Bob came by on his bike and we stopped to talk. There were perhaps 15 or 20 people at that first meeting, and Bob was in charge.With real vision, he outlined the problems and we discussed what might be done. 1) Homes were being built higher and higher in the foothills.The City Council seemed ready to expand the City’s water system by installing pumping stations to deliver city water to developments that were at higher elevations than the existing city reservoirs. 2) The Council seemed to be careless and was ignoring engineering recommendations in regard to hillside stability and drainage when it approved developments in the foothills. 3) Boulder’s population was growing, so we knew that the pressure to develop the foothills with trophy homes would be increasing steadily. 2) Sometime in the mid-fifties, the City Council had a proposal from a developer to put a large apartment complex on the Chautauqua fields just immediately south of Baseline Road.The developer claimed that this development would be a major asset for Boulder.This was stopped by a very remarkable lady, Mrs. Florence Sibert. 3) At some point in the 1950s the City Planning Board approved the subdivision plat for a new subdivision on the slope of Flagstaff Mountain west of 6th Street.College Avenue and 6th Street were both paved, but west of 6th, College was a gravel road that climbed steeply up the slope and ended perhaps a hundred meters up the slope.The subdivision in question was west of the end of the gravel road and the proposed subdivision could be accessed only by driving up the steep gravel road.When the Planning Board approved the subdivision, they sent the plans to the Council with a list of about six specific engineering requirements having to do with stabilizing the steep slopes and with taking care of runoff from rainstorms.Council approved the subdivision without requiring that the developer make the specified engineering improvements.This left a paved subdivision that was reached only by a small steep gravel road.The existing residents along that gravel road were happy with things as they were before the subdivision came along.Quite understandably, they did not want to have to pay for the paving of the short road section in front of their homes just in order to accommodate a subdivision to the west of them that they did not want. After the Council approved the subdivision without the recommended engineering drainage requirements, I remember at a meeting, Bob saying, “This proves that you can’t trust the City Council.”This seemed to support our feeling that the Council would not make the hard decisions that were needed to protect the people of Boulder. The wisdom of those engineering requirements was demonstrated by two incidents some years later.Possibly because of the lack of measures to stabilize the cuts the developer had made in the hillside, there was a minor slide of land above a cut in a steep slope.It was sufficiently small as to do little damage, but it could have damaged a home had it hit one.In the second incident, a heavy rain fell, and the paved subdivision streets caught the large flow of water and directed it down the steep gravel section of College Avenue.Large quantities of gravel were washed out of the steep road and were deposited in the house at the NW corner of 6th and College.It cost the City plenty to clean up the mess, pay for the damage, and then to pave the short gravel section of the road. 4) I am not sure of the chronology, but I remember news that at some point the Council was considering annexing land well up Sunshine Canyon, and this would then require the City to purchase pumps and build a pumping station near the mouth of Sunshine Canyon to pump city water up to the proposed subdivisions. I am not sure where or how the idea of the Blue Line originated, or how it came to be called “Blue.”But the idea emerged of drawing a north-south line and saying that the City would not supply city water west of that line.Bob recognized that such a requirement would have to be a part of the City Charter if it was to be meaningful.If the Council established such a line as an ordinance, it would not be permanent, and it could be modified by the Council at any time.But the Council was not interested in placing any such blanket restrictions on development.Their approval of the subdivision on West College galvanized our group into action. Sometime in early 1959 we formed ourselves into a group called “Citizens for the Blue Line.”Bob McKelvey was Chair of the group, and I was Vice-Chair and Secretary-Treasurer.The formation of the Committee was recorded in the Boulder Daily Camera on April 21, 1959. After a number of discussions of where the Blue Line should be drawn, a group of us took a Sunday hike in the foothills from south to north to identify landmarks that would define the Blue Line.There were only four or five of us, and I think that in addition to Bob and me, we were accompanied by Hugh McCaffrey, Harold Walton and possibly someone else.I carried a clipboard and took notes of landmarks.We started our hike somewhere around the present west end of Dartmouth Avenue.From there south, the Blue Line was to be a contour line at an elevation something like 30 feet below the mean water level in the Chautauqua Reservoir, so we did not need any complicated description of that portion of the proposed Line.As we walked north, we generally followed the City Limits as they existed at that time.The line could not be put east of the City Limits because the City could not deny water to lands it had already annexed.There may have been locations where the Line was west of the City Limits. I then took my notes to an attorney who put the description of the Line in proper legal form and helped us with the drawing up of the petitions.I remembered the attorney as being George Williams, but now I think that is wrong.There may have been another Williams who was an attorney. We knew that we would need support in the business community if our effort was to succeed.I can remember going to talk with “Gov” Paddock who was editor of the Daily Camera.I found him in his office in the old Camera Building at 11th and Pearl at a desk that was piled high with paper and with his old antique Oliver typewriter was centered on his desk.This is the typewriter that is on display in the lobby of the new Camera Building at 11th and Pearl.Gov was very kind and very supportive.He recognized that I was just a neophyte and he offered advice and encouragement.I also talked to several other business people on Pearl Street including Jim Yeager who operated the women’s wear store Brooks-Fauber on the north side of Pearl Street between Broadway and 13th Street.I was very pleased with their indications of support for the idea. The Council had rejected our request that Council put the question of a City Charter Amendment on the ballot, so we had to petition to have a special election.At the top of the petition one had to print the names of five citizens who were sponsoring the petition.As I recall, Bob McKelvey and I were two of the names, and the other three were Bob Carlson, who was the minister at the First Congregational Church, Gayle Waldrop, who was Dean of Journalism and who had served on the City Council in the late 1940s, and Florence Sibert. Florence played an interesting role in all of this.She was a lawyer, but I don’t think she had an active practice.Her husband, Harold, was a Professor of Aeronautical Engineering.Florence watched the Council very closely, and she loved to catch the Council doing things that violated the City Charter, or violated common sense.On one occasion, I believe the Council was ready to enter into some sort of agreement that would allow the development of an apartment complex on the beautiful Chautauqua meadows just south of Baseline, as was mentioned above.She blew the whistle, and angry citizens joined her in stopping this unfortunate proposal.On another occasion, the County Commissioners were about to do something on Courthouse Square.Perhaps they were going to put in a great deal of parking.She looked up the records of the City’s deeding the Square to the County and found that such a use of the Square was prohibited in the deed, and in calling attention to this, she forced the Commissioners to back off in their plans. Shortly after we had initiated the petitions, Florence said she was going to withdraw from our Blue Line effort because she had a fight of her own with the City and she did not want to have the two efforts confused.The City needed to expand its water treatment and delivery system.It hired some out-of-town engineering firm to draw up plans, and these plans, if I recall correctly, called for the City to take water from the tailstock of the Public Service Company’s hydroelectric plant up Boulder Canyon and run the water to a new treatment plant that would be built further down the Canyon.The water would be treated and then would be delivered to Boulder via a new pipeline that would run down alongside the existing city water lines that were by Boulder Creek.You have seen those lines that crossed the Creek on the bridge abutments of the old narrow gauge railroad that ran up Boulder Creek to Four-Mile Canyon. Florence was not an engineer, but common sense told her that it would be irresponsible to locate a water treatment plant in the bottom of Boulder Canyon where it could be wiped out be a flood such as the City experienced in 1894.The City’s water treatment plant and delivery pipelines would all be vulnerable to destruction by a flood because both the new and the old water lines would be located by the Creek.In addition, she took issue with the sanity of the financing plans for this proposed expansion of the treatment plant. The Blue Line petitions were printed, and so a small group of us set about to gather the necessary signatures.Standing outside grocery markets and on Pearl Street, we gathered signatures on petitions until we had the requisite number of signatures, with quite a few to spare. One very colorful person helped us in the gathering of signatures.This was Mrs. Helen Fischer, widow of Valentine Fischer who had served on the Board of Regents, and who was herself a graduate of the University of Colorado around 1908.The Helen Waltemeyer Fischer Field on the campus is named for her.Mrs. Fischer had a heart of gold, she was big, and she was enormously enthusiastic about projects that she supported.She was very aggressive in her gathering of signatures. The Camera of May 22, 1959 carried a letter that said the collection of signatures was going well.We collected the necessary signatures, and plenty to spare, and on May 27, 1959 I personally delivered the stack of petitions to the City Clerk, Carl Chapel, in his office in City Hall.Before the petitions were delivered, a group of us sat around our dining room table copying down names and addresses of those who had signed the petitions.We needed to have a mailing list for mailings we planned to send out during the actual election campaign.The signatures were checked and the Council was forced to set an election date.They chose July 21, 1959.There were to be two issues on the ballot.One was the City’s water bond issue which was strongly opposed by Florence Sibert, and the other was the Blue Line Amendment to the City Charter. So the battle lines were drawn.The fight was on. As I recall, the water bond issue was supported by the City Council and all of the establishment in Boulder, who seemed to pay no attention to the engineering and fiscal objections raised by Florence Sibert.The Blue Line was strongly opposed by individuals who said this constituted a denial of property rights of owners of land above the proposed Blue Line.The development sites west of the Blue Line made the developers’ mouths water.Think how nice it would be, one of them told me, to have homes up on the big mesa south of town (where NCAR is now located)! In addition, there was a philosophical debate over the best way to deal with growth.The Council seemed to feel that you should build water lines and buy pumps so you can pump city water up to these mountain subdivisions, and then the developments take place within the City and the City can control the developments to make sure they are done right.We saw this later with City Manager E. Robert Turner’s “Spokes of the Wheel” idea in which the City would extend water lines out to the Gunbarrel area and in this way the City could control the development that took place.Opponents of the Blue Line pointed out correctly that the Blue Line would prohibit the annexation to the City of lands west of the Line, but if these lands could get their own water, they could develop in the County, and the City would have nothing to say about the developments.Indeed, before the Open Space election of November 1967 there were rumors that developers with lands west of the Blue Line were negotiating to get a waterline from the City of Denver to run north from Eldorado Canyon to serve lands west of the Blue Line. We knew that the Blue Line was only a temporary holding action and we knew that in the long run, the City of Boulder would have to own these lands if they were to be protected from development.This was to be the first step, but I had no idea how we might proceed afterwards to get city funds sufficient to purchase these lands. At the end of the spring semester, Bob McKelvey left to spend the summer at the University of Wisconsin so, as Vice-Chair of Citizens for the Blue Line, I had to run the election campaign.As I recall, the total money we collected for the effort was about $500, and half of this had come from one “angel,” Frank Havice, who later was elected to the City Council.We made great use of the “Letters to the Editor” in the Camera.The main other effort I remember was the preparation and mailing of postcards to those who had signed our petitions.Professor John Greenway of Anthropology drew up a nice representation of the Flatirons with a line below them and a message something like “YES FOR THE BLUE LINE”.We had the drawing and message reduced in size and printed in blue on one side of regular post cards from the Post Office.Then we had to address these few thousand cards by hand.We had evening addressing sessions in our dining room where we all sat around the dining room table addressing the cards using names and addresses that we had hand-copied from the Blue Line petitions. Ruth Greenway and Mrs. Reuben Zubrow were two of the people I remember working on the addressing of the post cards.I took the cards to the Post Office to mail them, and we continued writing letters to the Camera. The election was held on July 21, 1959.The Blue Line passed by a vote of 2735 to 852.We were overjoyed.We had taken on the City Council and much of the Boulder establishment, and we had won.But we knew the victory was only temporary because the lands west of the Blue Line could be developed in the County, and we would have little to say about the quality and nature of the development.But at least, we had made a start. The water bond issue which was on the same ballot was defeated.Single-handedly, Florence Sibert had taken on the City and the Boulder establishment, and she had defeated them.A few years later, and with a new City Manager, E. Robert Turner, the water issue came up again, and this time the new water treatment plan was proposed to be up on a ridge where it could not be damaged or destroyed by floods in Boulder Canyon.This later bond issue was approved by the voters and the Betasso Water Treatment plant was built. Bob McKelvey came back from his summer at the University of Wisconsin that fall, and under his leadership we got the group together that had pushed the Blue Line effort.We wanted to keep up the momentum that we had as a result of the success of the Blue Line election.So we called a meeting at the Washington School on north Broadway on September 24, 1959 and at that meeting we formally established ourselves as PLAN-Boulder. Later the name was expanded to PLAN-Boulder County. The early efforts of PLAN Boulder involved William and Jean McDowell, (Bill was a civil engineer. ), Ruth Greenway, (Her husband was John Greenway, a professor of Anthropology at the University.) Gayle Waldrop, (Gayle was Dean of Journalism), Frank Havice, (Frank was a retired engineer.) Ann Zubrow, (Ann’s husband was a Professor of Economics), Al Bartlett, (Professor of Physics),Hugh McCaffrey, (banker), Bob and Mavis McKelvey, (Bob was a Professor of Mathematics.) Ed and Gladys Weibel, (Ed was a Professor of Mechanical Engineering and Gladys worked in Norlin Library), Lynn and Arlene Wolfe, (Lynn was a Professor of Fine Arts. ), Kurt and Eva Gerstle, (Kurt was a Professor of Civil Engineering).I am sure there were more in our little group.I apologize for not remembering all of the names. It is often said that the PLAN of PLAN Boulder County is the acronym for People’s League for Action Now.I don’t remember how the name came into being.I have the impression that the PLAN was to emphasize planning and that the acronym. We knew that the Blue Line was just the first step and that much more had to be done.But we had successfully completed that first step toward getting a system of Greenbelts established for Boulder.The next step was the bond issue for the purchase of the Enchanted Mesa, which was followed in 1967 by the Greenbelt / Street Improvement Sales Tax election.This issue was approved by Boulder voters and as a result, by 2008 over 40,000 acres of Greenbelt / Open Space land has been purchased and preserved for the enjoyment of the people of Boulder.